This is a departure from the great salmon patty. 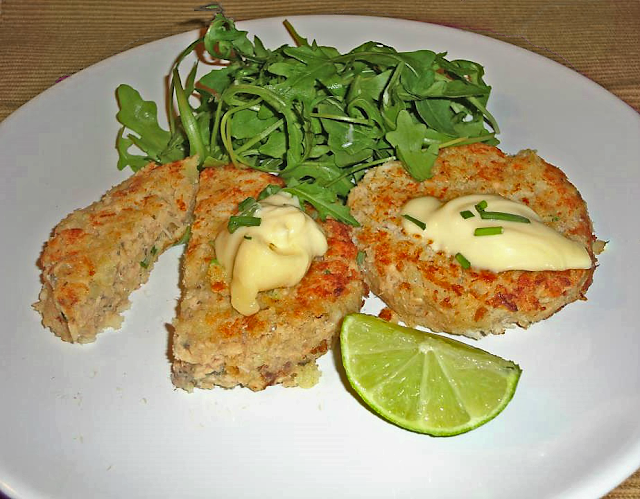 I know there are a great deal of recipes out there for salmon potato cakes, but the lime mayonnaise may truly be the thing that makes these stand out from the rest. Potato cakes are additionally scrumptious in a burger bun with the added mayonnaise to avoid them from being excessively dry. Fresh dill was used here but dried dill will work fine. One tablespoon of chopped fresh dill is the equivalent of one teaspoon of the dried kind but if you want more delectable flavours then try to take the fresh herb approach. 1. Boil the potatoes in a large saucepan of boiling water for until tender, 12-15 minutes. Drain well and cool. 2. Meanwhile, combine the lime rind and the mayonnaise. 3. Mash the potatoes in a large bowl, leaving some large chunks. Stir in the salmon, dill and spring onion and season with a little salt and pepper. Mix in the egg and the remaining mayonnaise. 4. Divide into 8 palm-size potato cakes. Press lightly into the breadcrumbs to coat. 5. Heat the oil in a non-stick frying pan and cook the potato cakes, turning, for 3-4 minutes on each side or until golden brown. Drain on paper towels. 6. Serve with the lime mayonnaise, rocket leaves and lime wedges.